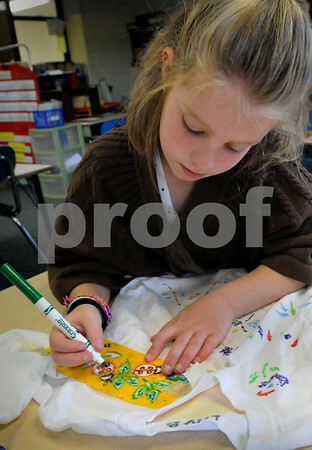 Amesbury: Lilly Buckley, 7, uses a stencil to color lady bugs onto a t-shirt in Pauline Fitzgerald's class at Amesbury Elementary School on Tuesday. The children have been learning about insects are making the shirts for a trip to the Boston Museum of Science. Bryan Eaton/Staff Photo Newburyport News Tuesday June 9, 2009.